HTC's Vive X accelerator program sees a host of startups completing a series of challenges to help shape the future of VR on both software and hardware fronts. 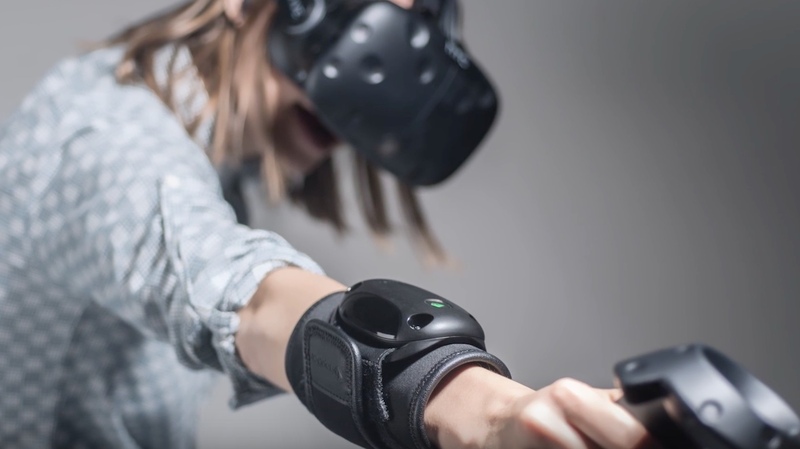 It's already helped bring to life some impressive tech including TPCast, which created an add-on that allowed Vive headsets to go fully wireless. There was also 7invensun's eye-tracking add-ons, which brought real-time eye tracking to the Vive for the first time. It's a four-month program in four cities across the world that has $100 million in funding, Marc Metis, global head of Vive X, told Wareable the goal isn't to just enrich the Vive ecosystem either, it's to expand the entire VR and AR ecosystems. Metis says the accelerator has a lower rate of acceptance - 5% - than most Ivy League schools, helping fund 60 companies thus far. The goal, says Matis, is to get these companies to the next level as quickly as possible so that they can shoot to the front of the pack in their chosen segment. "These companies are at the cutting edge of the cutting edge because they're making incredible advancements in lots of very, very specific areas of expertise that no one's seen before in VR," Metis said. So what future TPCast's and 7invensun's could emerge from Vive X? Which companies could change the way we experience AR and VR? I got a chance to check out some of the new tech in the second batch of companies admitted to the program. These are the best of the 27 companies showcased. Virtual reality is supposed to transport you to a new world and become totally immersive, but at the end of the day you still know that you're holding a plastic controller in your hand. Sure, most VR controllers are well formed to be as immersive as possible, but they still feel the same. TEGway's ThermoReal controllers are looking to change that. They're able to simulate cold and hot temperatures. For instance, in my demo I was piloting a fighter jet. When I pulled up and sent the plane into the heavens, overworking its engines, I could feel the controller getting hot - just like the engines. If I pushed down and sent the plane spiralling toward earth, its engines off and the cold atmosphere overtaking my jet, I could feel the controller getting ice cold. The technology, which uses thermoelectric panels, can fit into a host of controller types, from joysticks to VR controllers to controllers for smartphones. Brian H. Yoo, vice chairman of TEGway, told Wareable that the controllers will soon be able to simulate pain (it'll feel kind of like a pinch). You remember how terrifying floating through space looked in Gravity? Well, Opaque Space's Earthlight does a good job of replicating that. It's a narrative first-person VR game developed in collaboration with NASA, which makes it incredibly authentic and immersive. You play an astronaut going out and doing astronaut-y things, like checking on modules and replacing cables. You have to make sure you're always holding on to something, otherwise you might float off and die - trust me, it happened to me. It may sound a little monotonous, but everything feels so authentic that you could probably use it to train potential astronauts. And, well, that's exactly what's happening. NASA is using Earthlight to help train astronauts, and Opaque hopes to do the same when commercial flights to space finally become a reality. The only thing that was missing is being able to play Earthlight without your legs on the ground, though director Emre Deniz said he was able to do exactly that. He also told me I got through the demo faster than others that try it for the first time. I'll see you in space, ya? At first glance, SoccerDream looks like a VR soccer game. You run around, pass the ball, and score goals. After trying it out though, it's definitely not a game, it's a training tool. The goal is to help develop soccer IQ in young children who may not be able to go to the more prestigious soccer academies, like the ones developed by FC Barcelona and Real Madrid. When you put on the headset, the software starts to analyse how you play the game. Do you get in the right positions for your team mates? Did you find good passing options? How was your passing vision? When you're done with your session, it rates your performance and tells you how you did (I did horrifically, for the record). It's powered by Ekkono, a cognitive soccer training method used by the biggest club. In our demo, we only received simplistic feedback on more general data types, but CEO Andreu Bartoli says it gets far more complex as you move through the program. Limitless VR Creative Environment -- GDC 2017 from Tom Sanocki on Vimeo. Animating is gruelling work that takes hours upon hours upon hours. You can spend a week of hard work on a few seconds of footage, and if you decide you could do better you have to go back and do it all again. Limitless, founded by veterans of Pixar, DreamWorks Animation and more, wants to ease that burden by allowing you to animate in VR. You're dropped into a 3D scene and can move and walk around. Animating your characters is about as easy as animating an action figure. I was able to do a simple animation that was about 10 seconds total in about 5 minutes. That is obviously much, much faster than doing a couple seconds in a week of work. So not only is Limitless able to make animation much easier, it's able to make it far more accessible, potentially bringing more people into animation. This is a wellness program that can do a couple things with one goal: clear your mind of any stress or pain you may be feeling. The first thing it does is to help those with chronic, hurtful pain forget about it for a little while, potentially aiding in recovery. For example, if your left arm was in so much pain that you could barely move it due to an injury, WiseMind would help trick your mind into thinking it was fine. It does this by putting you in an experience where one arm is mirrored. So if your left arm is injured, it'll mirror your right arm - and all it's actions - onto your left arm. Your mind will think your left arm is functioning fine, but in reality it's not moving. I can't speak to the full effectiveness of the demo because both my arms were fine, but it definitely has a reverse phantom limb kind of effect that's surreal. The second thing it does is a very immersive version of VR Tai Chi that's incredibly effective. Despite being in a loud room filled with people, I was able to fully block out the world and focus on my body completing the movements. It does this by playing super loud music (Star Wars' Duel of the Fates in my case) and having you interactively match movements by catching black and white bubbles in sequence. Fully creating VR immersion is going to mean having some sort of haptic feedback on our real bodies when something happens to our virtual bodies. We've seen companies try to enter this space with products like Teslasuit, but those are going for upwards of $1,000. bHaptics hopes to make these haptic feedback suits a little more affordable, like around $549. We were able to try one of their solutions, which gives you a vest, arm bands and some feedback on the headset itself. Let's just put it this way: playing a game without bHaptics tech felt like there was something missing. Not only is it effective, it's able to produce a number of different effects. We could feel things being thrown at our head (ouch), we could feel swords slashing our midsections, shotguns hitting our sides and, most terrifyingly, a bomb. Oh, and we also got injected by a huge zombie monster. That was not fun, but it did make for an incredible experience. Appnori and Red Accent are taking two different approaches to sports games in VR. Appnori is using the Vive Tracker to take real world objects, like baseball bats and table tennis paddles, and allowing you to play games with them. It's incredibly effective, and has far less latency and is much more immersive than something like Wii Sports. On the other hand, Red Accent is aiming to make more complex sports games in VR. The one it showed off was an NBA game where you can dribble the ball, steal the ball, pass, shoot and dunk. Dunking was something special, because it actually feels like you can dunk. Bonus: The physics are a bit loose so you can dunk from the three point line. Eat that, Michael Jordan. While Aurora's AR glasses are clearly in the prototype phase, they've got the technology to put together a pair of glasses with a wider field of view than anything else out there now, including Microsoft HoloLens. The company said its field of view is 135 degrees. Trying out the demo, which displayed a cute cartoon AR dragon that you could walk around as he flapped his tiny wings, it was easy to see that it did in fact have a wider field of view than its competitors. It was kind of like holding a regular iPhone about two feet from your face. The company says it'll be a standalone headset that can also work in daylight. Unfortunately, we were only able to try out the headset in a dark corner of HTC Vive's offices. It'll be in beta later this year.